Are you ready for the big game? I know who we are rooting for, and even if some of our guest will be rooting for the other team, we can still be friends! I have 3 Ninja Foodi or Instant Pot Game Day Appetizers that you will want to whip up! Best of all is you can make each appetizer back to back without needing to clean your pot in between! Yep, you read that right. 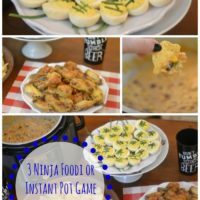 I created 3 recipes for game day appetizers that you make in your Ninja Foodi or Instant Pot. Because you are cooking back to back you don’t have to wash, dry your inner pot. It makes cleanup so much easier, and you have three outstanding appetizers to add to your finger food table. So I started out by using the football deviled eggs! They use the 5-5-5 method for the perfectly cooked hard boiled eggs. The filling for these easy deviled eggs is hands down a blue ribbon recipe. Savory with a slight hint of sweet. Once you are done making your eggs, just simply wipe out your pot, and then move onto your crispy wings! This saved me so much time from having to wash my pot. Now this is one game day appetizer you don’t want to miss out on. Crispy skin that is seasoned nicely, with a juicy and tender chicken waiting as you sink your teeth into these chicken wing. Pair with your favorite dipping sauces and serve up these little nuggets. I used my Ninja Foodi which made the process a breeze. I started by using the Instant Pot feature on pressure cooking the chicken wings. Once I got them cooked up, I swapped lids for the Air Fryer crisping lid, which gave these wings a nice crispy skin. The Ninja Foodi makes the best hands down crispy chicken wings. Even your favorite wings can’t compare to the flavor and juicy factor these wings offer. 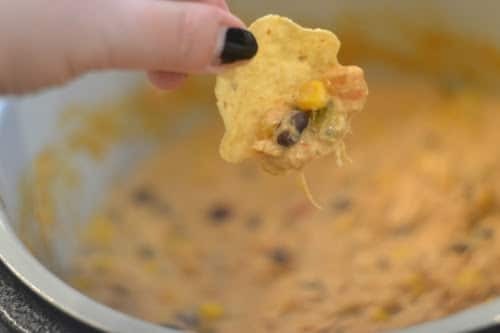 Once you are done making your wings just simply dump leftover butter out of your pot, and then move onto your chicken taco dip! This saved me so much more time from having to wash my pot. Serve up this warm and delicious Ninja Foodi Chicken Taco Dip. Grab those salty chips, baguettes or even crackers or fresh vegetables and dive in. Cheesy, creamy, and loaded with shredded chicken, beans, and corn. Serve warm, and watch this chicken taco dip disappear in no time. A tried and true recipe that will be absolutely a crowd worthy dip. You can serve your Chicken Taco Dip directly in your Foodi while keeping it warm. You can also transfer it to a pretty serving dish, if you do not mind cleaning an extra dish. I find these three appetizers work well together in flavors and textures. I love how the football deviled eggs are chilled and a lighter option. 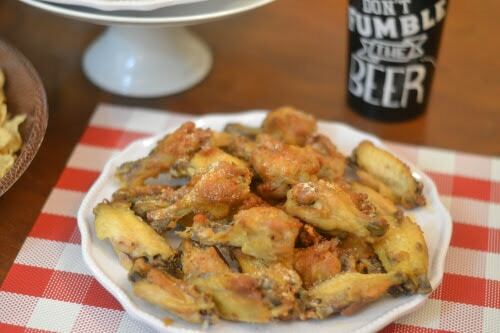 The crispy wings offer a nice crunch factor that is loaded with protein. Then you end it with a creamy and cheesy dip that feels like a total indulgence. You have a nice variety. You can also pair it with even more appetizers for a bigger feast. Depending on the number of attendees will depend greatly on how many appetizers you need. Having at least 3 or more appetizer options is great if you are keeping it to finger foods only. You can gauge that around 6-8 appetizers per each person might get eaten. So say someone eats 2 deviled eggs, 4 wings, and a few tablespoons of dip. Try to gauge how many people you will have over so you know around the correct amount of appetizers to serve. 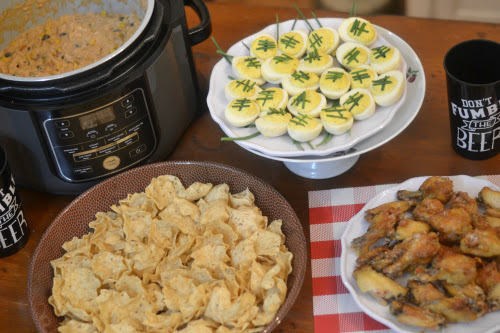 So, if you have an Instant Pot or Ninja Foodi, try out my 3 game day appetizers. Not having to clean your pot in between each appetizer was a GAME CHANGER! I am not big into dishes, so taking the time to make these appetizers at once saved me big in the long run! What is your favorite game day appetizer? 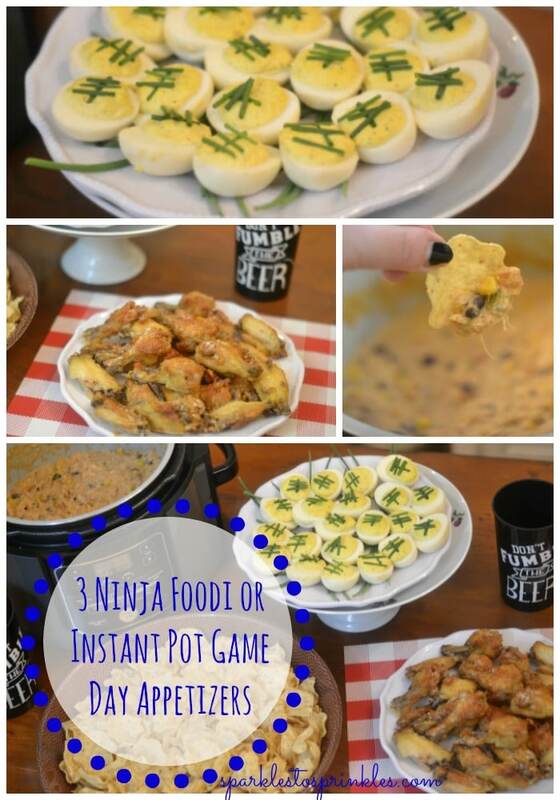 Make 3 amazing game day appetizers using your ninja Foodi or Instant Pot. There is no cleanup in between!! Game day has never been so easy. Start cooking your eggs for Ninja Foodi or Instant Pot Football Deviled Eggs. While the eggs are cooling in ice, empty the water from your pot and pour in 1/2 cup chicken broth, as needed, for your Ninja Foodi or Air Fryer Chicken Wings. Cook the wingettes according to the recipe. While you are crisping your wings, you will prepare the filling for your deviled eggs. Pipe deviled egg filling into egg halves. 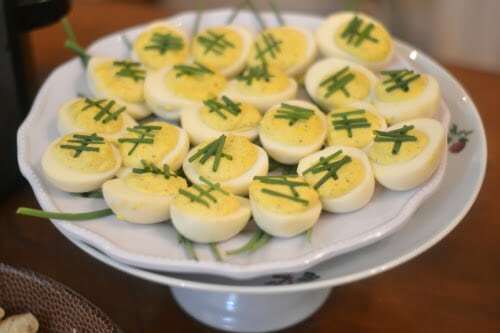 Decorate the deviled eggs as footballs using chives. Remove chicken wingettes from the pot. Empty leftover butter. Start to prepare the Ninja Foodi or Instant Pot Chicken Taco Dip. Once your Chicken Taco Dip is done, get your party started.